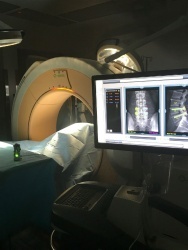 The state’s first spine procedure using the Mazor Robotic System in conjunction with intraoperative imaging was performed by neurosurgeons with Neurosurgical Associates, PC at St. Vincent’s Birmingham. Few facilities in the world have this capability which is extremely helpful in lumbar spine procedures. Neurosurgeons at St. Vincent’s Birmingham are the first in Alabama to adopt the Mazor technology and have completed multiple procedures using this advanced technology. The Mazor system allows surgeons to preplan a custom procedure for each patient using a CT, or intraoperative scan exclusive to St. Vincent’s called Scan and Plan. The surgeon is then able to plan the procedure and implant trajectories with extreme detail and precision in Mazor’s advanced software. The robot then assists the surgeon’s plan during the procedure with unparalleled accuracy allowing for much of the surgery to be achieved percutaneously. This percutaneous approach limits the amount of muscle retraction needed to achieve adequate access during the procedure. Surgeons have reported less blood loss, faster recovery time, less exposure to radiation, and overall improvement in the procedure when compared to traditional open procedures.